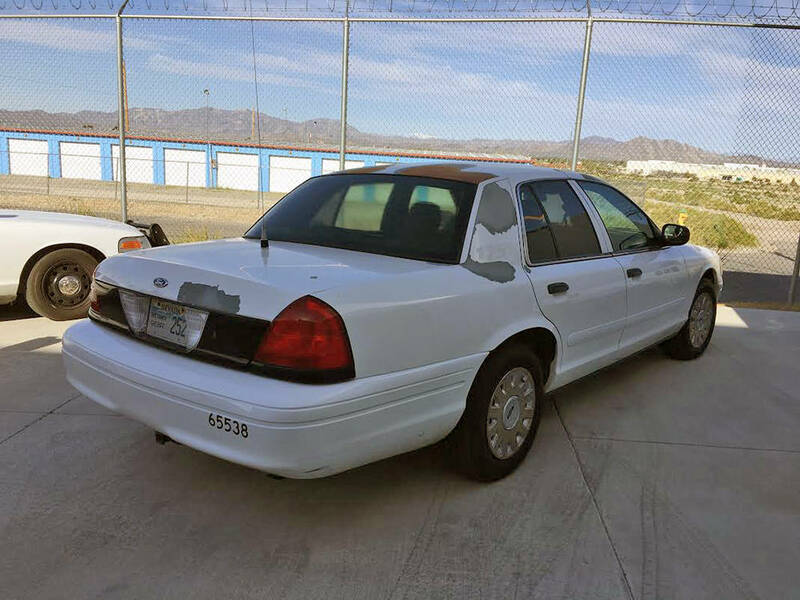 In April 2018, the Nye County Commission approved the initiation of a new fleet vehicle program with the goal of consolidation and updating its aging automobiles and the program is now nearing its second year. 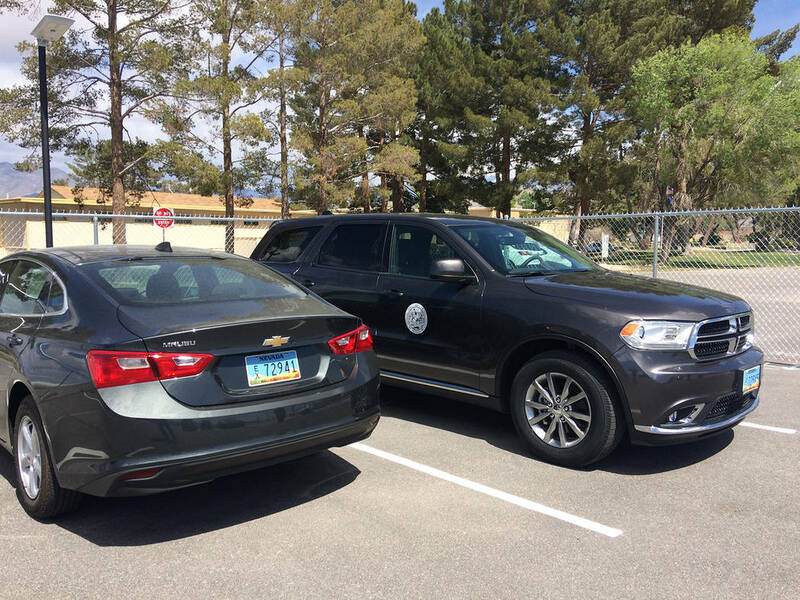 Robin Hebrock/Pahrump Valley Times Pictured are two of the 35 vehicles obtained by Nye County in the first year of its fleet vehicle program, furnished through Enterprise. Special to the Pahrump Valley Times This is just one of the Nye County Sheriff's Office vehicles that is planned for replacement through the Nye County fleet vehicle program. Robin Hebrock/Pahrump Valley Times There are more than two dozen old Nye County vehicles that have been approved for excessing, all replaced by new vehicles in year one of the county's fleet program. During its Tuesday, April 2 meeting, the commission voted to approve a resolution outlining its intention to seek a $950,000 loan in order to continue vehicle acquisitions under the fleet program, furnished through Enterprise. “This item is an authorization to request an approval from the Nevada Department of Taxation for Nye County to take out a medium term obligation for year-two fleet acquisition,” Nye County Comptroller Savannah Rucker reported. 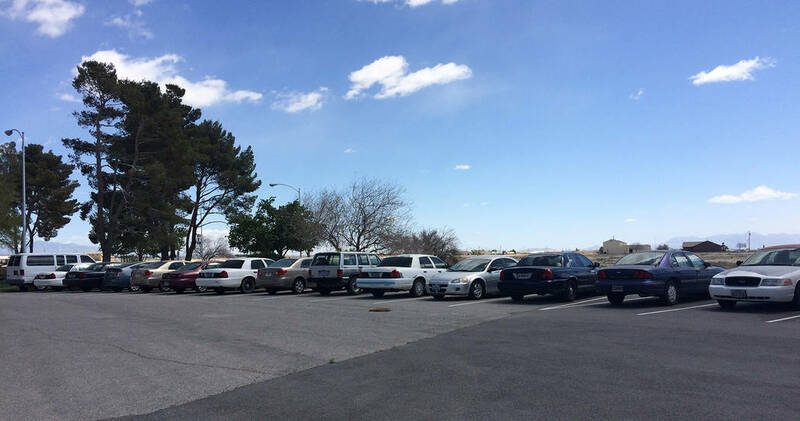 Rucker explained that between 20 and 25 vehicles would be replaced in the year-two program, with the major focus on obtaining vehicles for the use of the Nye County Sheriff’s Office. “Our police fleet is just in terrible shape, as I am sure the sheriff can attest to,” Rucker stated. Nye County Commissioner Leo Blundo, who was not a member of the board when the first year of the fleet program was approved, requested more extensive details about the program, specifically the lack of information on exactly what would be acquired. Rucker stated that the goal is to lease vehicles from dealerships that would allow the autos to be serviced in Pahrump, such as the newly obtained Dodge and Chevrolet vehicles, leased during the first year of the program. Blundo then pointedly questioned the cost of the fleet program versus the cost to obtain police vehicles from Las Vegas law enforcement’s surplus, which was far cheaper. Rucker informed the commission that the sheriff’s office was in fact still working with Las Vegas Metro to replace vehicles but acquiring them from over the hill is never certain and it always depends on what is available. Furthermore, Nye County Sheriff Sharon Wehrly detailed that many of the sources that have been previously utilized to obtain vehicles have started to shift toward a program similar to Nye County’s fleet program, meaning excess vehicles are becoming less and less available. Nye County Sheriff’s Lt. David Boruchowitz joined the discussion as well, pointing out that in the first year of the program, the only vehicles that were obtained were for administration staff, none were acquired for the public safety sector. Lamenting the condition of the sheriff’s fleet, Boruchowitz asserted that the vehicles break down quite often, creating a situation in which officers sometimes cannot respond to calls for assistance. Rucker agreed, stating that maintenance costs of the older vehicles had been a large financial burden and that was reduced with the addition of newer vehicles. She also added that other opportunities to obtain vehicles would still be sought but the need was too great to not address at least a portion of it with the fleet program. Though Blundo’s concerns did not appear to be totally assuaged, when the motion to approve the resolution to seek the loan came to a vote, all five commissioners voted in favor. As of today, the county has obtained 35 vehicles in total through the first year of the fleet program. Thirty-four of those have already been delivered and one is undergoing manufacturing and up-fitting, which should be delivered in the next few months, Nye County Public Information Officer Arnold Knightly detailed. Thus far, the county has designated 27 vehicles as excess or surplus vehicles no longer needed as a result of the new acquisitions. The excess autos will be auctioned off sometime in the future. Knightly assured that the public would be given ample notice of that auction so they can participate. Another batch of autos is also awaiting approval by the commission to be added to the excess vehicles list. The county must receive approval from the Nevada Department of Taxation before actually securing the $950,000 loan. County officials estimated the approval process would be complete within six weeks. For more details on the Nye County fleet vehicle program, please refer to prior story coverage at bit.ly/2Z7JdyH on our Pahrump Valley Times website, pvtimes.com where you will find more coverage of Nye County government.